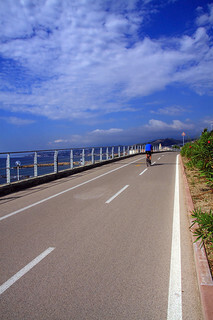 With this catalogue we propose hotels, holiday flat complexes and holiday villages suitable for sportsmen and sportswomen, fitted with all the necessary equipment to satisfy cyclists and mountain bikers, together with a selection of incomparable routes that you can explore with our experienced guides along the Italian Riviera. The Flower Riviera is one of the areas where modern tourism was born in the mid 1800s. Its main attractions have been almost kept intact, like its climate, which is extraordinarily mild all year round (average winter temperature 10° C, 24C° in summer), and the stunning natural scenery stretching from the Mediterranean shores to the peaks of the Maritime Alps. And, since those early days, with the creation of the Milan-San Remo classic race, which has just turned 100, it has become the home of great cycling, making the challenges of the big champions on the Turchino Pass and the Cipressa and Poggio slopes famous worldwide and popular with thousands of amateur cyclists. In recent years San Remo has also been in the spotlight for mountain bike lovers thanks to its downhill race and for the many cross-country tracks that explore paths and hamlets in the amazing Ligurian hinterland, where there is a fascinating combination of woodland and azure sea.